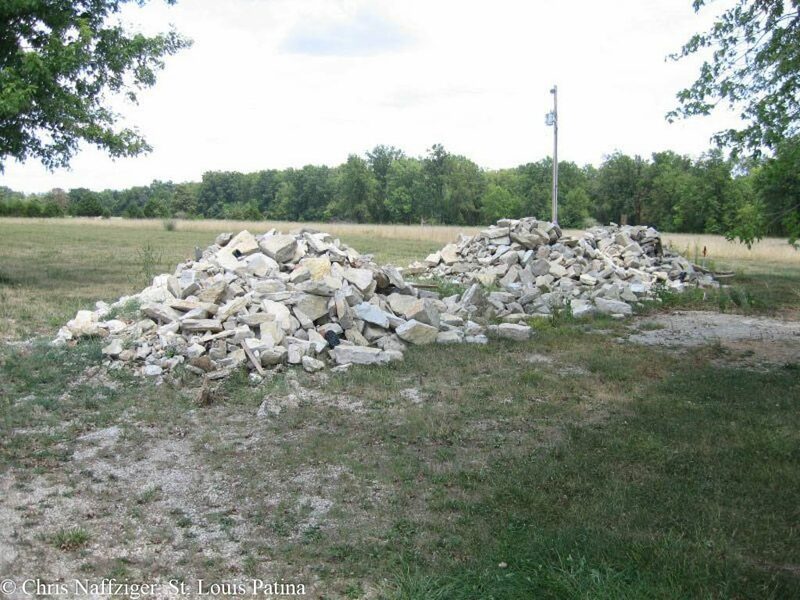 Alerted by a reader of this site, my father and I ventured out to rural St. Charles County to see for ourselves the sad remains of the “carefully” preserved Rock Hill Presbyterian Church, ignominiously demolished in a day for the building of a gas station. The stone is still beautiful, even lying in a giant pile, but as you can see no care was taken to preserve lintels or other cut stone imperative to the proper rebuilding of the church. I am certain, and based off of witness accounts of people who saw the church demolished, much of the most important stone elements were irreparably damaged. We continued up to the winery, whose owner had offered to take the stone for the purposes of attracting weddings. The winery is very new, so much so that they haven’t begun selling their own wine yet. 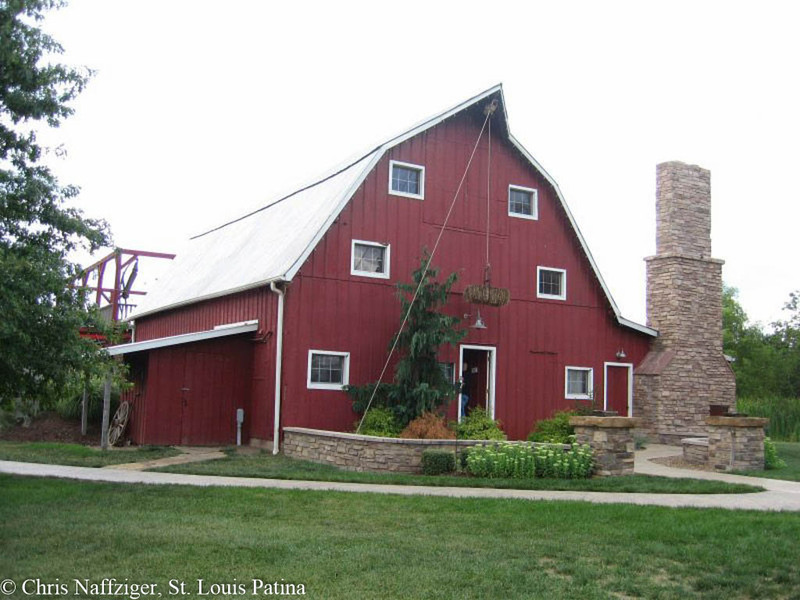 The winery has several well-restored barns as well as other farm implements. I believe the owner really does intend to rebuild the church, but whether or not it is actually done is the great question. Giant stone churches are hard to build, and I’m wondering if it will be nothing more than an ersatz stone structure when they’re done. But one thing’s for sure, he had better secure his historic stone piles better! 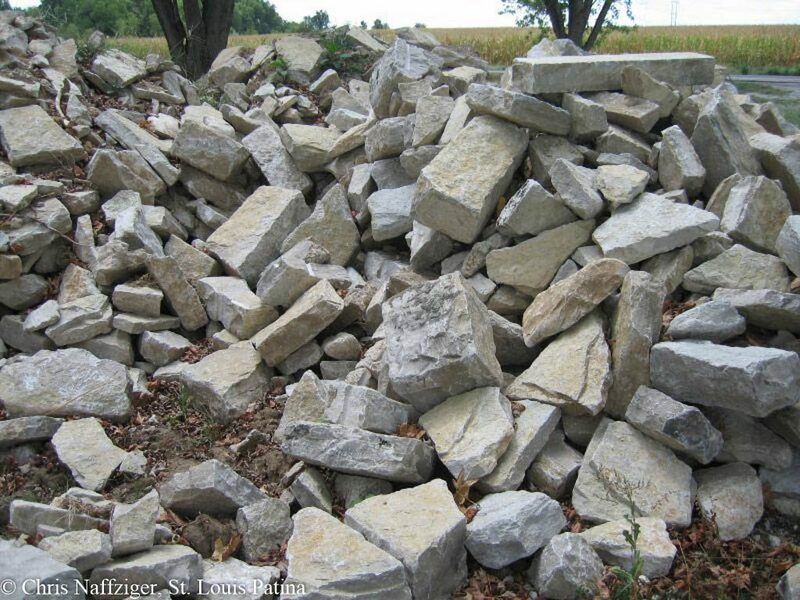 As we drove back by, a man with a Jeep Cherokee was in the middle of stealing a large heap of stones from the pile, loading them onto a small trailer hooked up to the back of his vehicle. 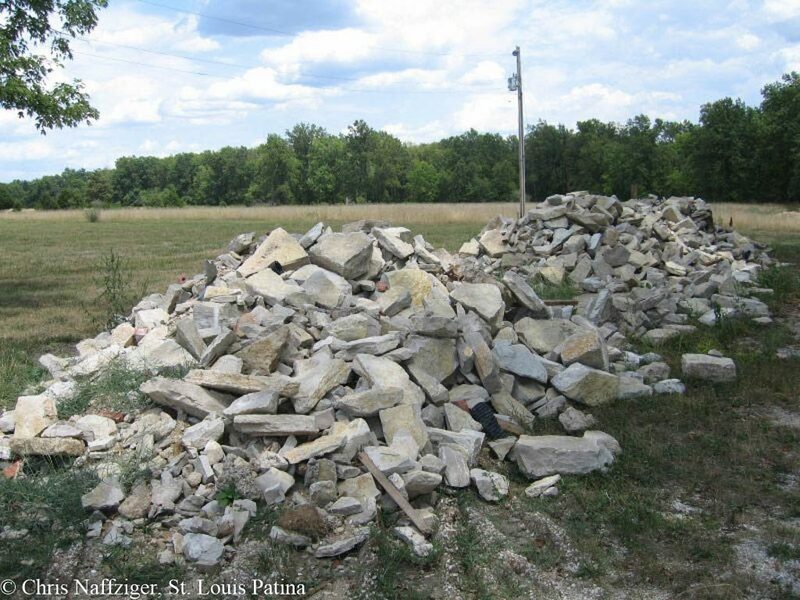 Update: The rock piles have vanished, and no sign of a church ever being rebuilt at the winery. It’s all but impossible that church will ever be rebuilt. Our country is so young that we have very little in the way of architectural history. No castles, no coliseums, no Stonehenge. Worse, to turn a quick buck, we tear down what little history we do have for a gas station, a strip mall, or a subdivision. I suppose everything has its price. Stil, it’s kinda sad to see our history disappear like this. When our oldest building is a Starbucks built in 1992 maybe we’ll wish we’d have been a little more judicious with the wrecking ball. Or not. Maybe nobody will care. There’s always a trip to Europe for history, right? I just happened to drive by the intersection of McKnight Road and Manchester just 10 days ago – and much to my surprise saw the church was gone. Something like 30 years ago my daughter spent two wonderful years in that pre-school (a 4 yr old ‘class’ and her actual Kindergarten year). I’ve always held warm thoughts when I passed that church! I had to call her immediately (she lives in Minnesota now) to share the sad news with her. Just what Rock Hill (or any other place) needs …another gas station. HORRIBLE decision – whoever reached it. No one has any respect for what their ancestors accomplished. Somethings cannot be replaced. Why don’t we stop teaching history to our children its obviously not that important. By my count Rock Hill already had three gas stations along their tiny, less than two-mile long strip of Manchester Road. Sure enough, within a few months of opening the gigantic new UGas station (built on the site where the city allowed a 150 year old building to be torn down) the Conoco down the street went out of business. CLOSED signs adorn their doors now. Don’t worry though…they’ll replace any of that missing tax revenue with their infamous speed traps. That scam is still alive and well in Rock Hill. I predicted this would happen; could you snap a quick picture of the closed gas station the next time you drive by? I’ll try to grab a pic today. Rock Hill is at it again. The old Book House will probably be torn down next in order to build a storage facility. What was the winery where the old stone church was supposed to have been rebuilt? Debbie, it is out in Warren County. I don’t remember the winery’s name. But stay tuned, as there is some good news in the future that I’m not at liberty to share yet.